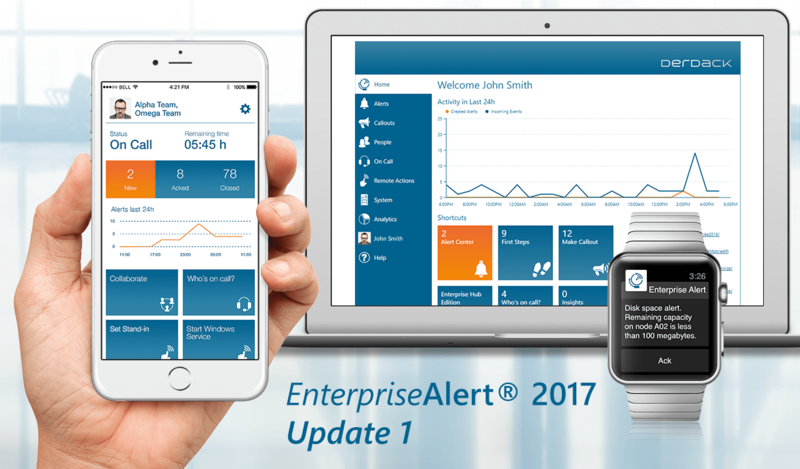 As of today Update 1 for Enterprise Alert 2017 is available adding exciting new features in particular a super-easy powerful REST webhook. You are going to love it! The new REST API is designed for super-easy integration with an abundance of 3rd party applications. We designed it as a multi-app event source. Use HTTP POST with any JSON/XML/text body that holds event details/parameters to submit an event to Enterprise Alert. It is super flexible and the API does not a specific format. Instead, you can let your source systems (e.g. VMware, Splunk, OMS, etc.) dictate the format without any alteration or coding. For each of these systems you create a dedicated new REST event source in the system section of EnterpriseAlert. Authentication is based on an API key, which means that usage of this API does not consume a user CAL. The API key can be submitted as query parameter, or e.g. sent as HTTP Basic Authentication credential. More details can be found in our updated Getting Started document. The REST API ships with OpenAPI (“Swagger”) online documentation and a Swagger UI “API Explorer”. It can be opened directly from the configuration details of a REST source (URL hyperlink) and contains the API description, displays authentication details and allows you to tryout the API from your web browser. As mentioned, the REST API is currently limited to receive events from your 3rd party systems in order to trigger automated alert notifications to responsible targets. However, we want to add further handlers, e.g. for user provisioning or alert retrieval in the mid-future. The REST API is part of the OpenAPI edition or any “higher” edition of EnterpriseAlert. Enterprise Alert does now support tags to mark and group teams. In the team details you can add one or more tags the same way as with Alert Policies. Teams can then be filtered by tags on the team overview page and on the “Who is on call” page. And of course, as always, we fixed some recent bugs and added performance enhancements. The auto-update mechanism will detect the update file providing for an in-place-update. Any new full software download contains the new version as of today. Happy exploring! We’ll provide some how-to videos shortly on how to utilize the new features, e.g. for integrating Enterprise Alert with Splunk.